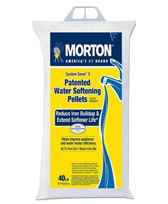 Morton® System Saver® II Pellets patented formula keeps water softeners running cleaner and longer. System Saver® II will remove substantially more from resin beads during the regeneration cycle than other pellets on the market, extending the capacity and life of your water softener. IN addition, you will use less salt and reduce cost associated with fouled resins, added maintenance cleanouts, and downtime.